…Have a drink with the guy you met on a dating site? …Encourage your tween to catch a ride home from soccer with another parent you don’t know well? … Open your front door when someone knocks? Many people go with their guts when they make such decisions. Should you? Not if you value your personal, financial, professional and emotional well-being! 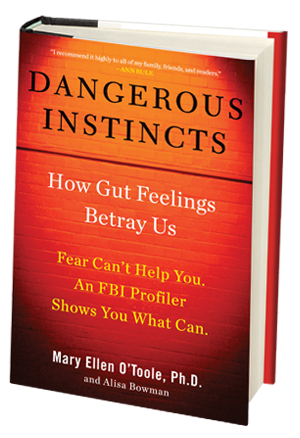 Despite popular belief, gut instincts are unreliable, untrustworthy and downright dangerous. What can you trust? Mary Ellen O’Toole, PhD, and her SMART method for decision-making.